Having yet to finish Higurashi Kai, I still have yet to formulate a final opinion on this season, but I will say this. One of the things that really made Higurashi so intriguing the first time around was the ambiguity between the natural and supernatural. The town of Hinamizawa really did seem afflicted by a supernatural curse by the capricious, cruel god Oyashiro-sama. 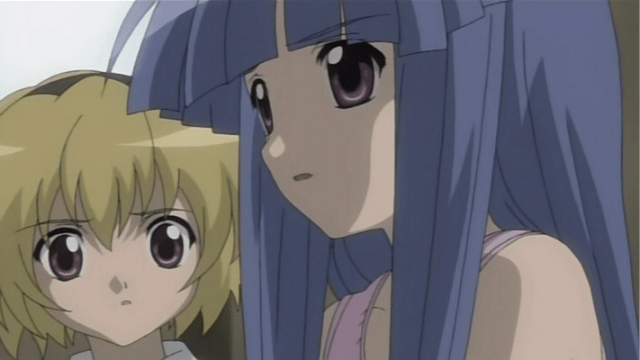 Through multiple overlapping and recurring arcs–a brilliant way to use the structure of the game for artistic effect–Higurashi was unequaled in its ability to trace through the roots of insanity and outright evil, how it starts from small little actions and the chain of incidents, while building different characters up in each arc as complex and even unexpectedly sympathetic figures if they were the “villain.” In past reviews, I’ve noted how relatively complex its view of evil is: simultaneously external (demonic) and internal, much like Tolkien’s Ring of Power and its curse. This season marked the turn away from the demonic to a fairly standard government conspiracy plot involving a biological weapon, led by the now-sinister-and-sympathetic (because of her past) Takano. That is the “curse,” with a fully natural explanation. It’s notable that along with this revelation, the amount of gore, torture, and violence has decreased dramatically–ironically because it was one of the shows that fell victim to Incident Nice Boat this summer. Had the girl murdered her father during the Detective Arc of season 1, that would have been understandable–it is one of the darkest and most harrowing stories I’ve seen in anime, while still remaining intelligent. The censors apparently were judging the show based on prior reputation, which it had long shed and, depending on your point of view, grew or fell away from. Again, mostly due to laziness and the time needed to review other new shows, I’ve fallen behind in my viewing of Kai, so I’m not sure how the show ends. (No spoilers please.) But I do see this as a significant moment because it shows, for one, that a series can sustain dramatic changes such as this without surrendering momentum or intelligence. By now the characters are ones we’ve come to know and the town a place familiar to our eyes. The world of Hinamizawa 1983 is a rich, multi-layered one, and even when the focus changes from the horror to the mystery there is still much to enjoy in this accomplished series. It just hit me. America has censors too but we call it the FCC.